Resilient cycling squad overcomes burnt bikes to excel at nationals. Duncan brother trio leads basketball Catamounts into season. Momentum building toward UVM arena/wellness center project. Student-athletes foster greater awareness, acceptance of mental health issues. In competition or in class, swimmer Sarah Mantz’s work ethic and collaborative spirit fuel success. Alumnus Jeff Schulman takes the reins as new athletic director. Head Coach John Becker leads the Catamounts through another strong season as March Madness looms. Close friends, outstanding students, and quite possibly the best line-up of distance runners in UVM history, meet the Fast Five. As she heads into her final season, Amanda Pelkey ’15 has helped build UVM women’s hockey into a contender. Former varsity athletes Matt Knittle '03, Kristal Kostiew '04, John Minahan '02, Aaron Yantzi '04, and special inductee Robert Cioffi '90 will be inducted into the Athletic Hall of Fame on Saturday, September 13. Javelin thrower Nikka Ouellette ’14 has earned four America East championships in four years, helping lead the track and field program to the next level. Hoops to hockey, an update on the performance and prospects of UVM’s winter sports teams. Lowell Bailey ’05 is poised for his third Winter Olympics as a top skier on the U.S. biathlon squad. As the UVM men’s hockey programs celebrates its fiftieth anniversary, we asked five alumni to share their memories. Head Coach Jesse Cormier’s roots go deep in UVM soccer, as the men’s team celebrates its fiftieth season. 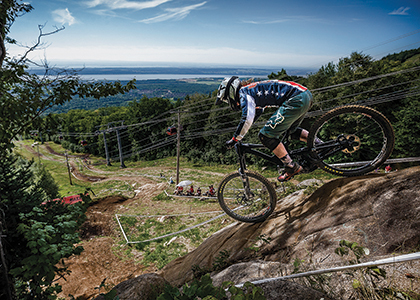 A photographic look back at UVM athletes in action. As championship season approaches, a look at performances and prospects.